News that Tiger Brewer has, at 8 years old, become the youngest person to be strapped to the wing of a plane has been warmly welcomed by “child-tying-up” enthusiasts around the world. Tiger Brewer “walked” a total distance of zero feet from his stationary starting position – strapped in a harness in the middle of the wing - watched on by his sisters, Star and Flame. 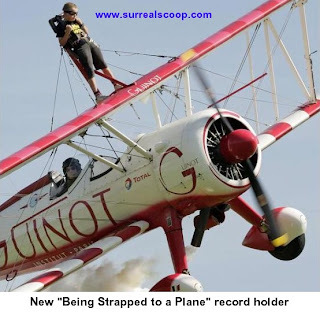 This equals the current best for modern wing walking since the technical variation “Being Strapped To a Plane” replaced the more conventional “Moving About Untethered” that many lay people associate with traditional wing WALKING. Tiger has practised hard to get the record for the youngest person Being Strapped To a Plane a task that involves standing up, aided, and perhaps wearing goggles. Child welfare enthusiasts have expressed their views on the issue regarding tying a child to a large and otherwise immovable object and the effect it could have on long term development.